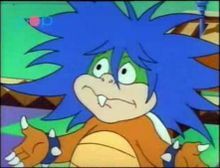 Ludwig von Koopa (known as Kooky von Koopa in the cartoons) is the oldest of the Koopalings, a clan of seven siblings that act as leaders of the Koopa Troop under Bowser (originally considered his children). As shown since the Super Mario Picture Books, Ludwig is a conceited show-off, with the recent official bios also underlining his intelligence. In terms of physical appearance, his most notable traits are his large, wild blue hair, his overbite on the upper snout and his eyebrows that are kept at a peculiar angle, conferring him a serious, mature look. He was named after composer Ludwig van Beethoven. 3.12 Encyclopedia Super Mario Bros. In Super Mario Bros. 3, Ludwig is the boss of Pipe Land. He's the eldest of the Koopalings and Bowser's second in command. He steals the blue magic wand of Pipe Land's king, whom he turns into a Piranha Plant or Yoshi in the original and Super Mario All-Stars versions of the game, respectively. In battle, he's able to generate earthquakes that stun Mario after landing from jumps, furthermore he attacks generating magic blasts with his magic wand and retreats in his shell both after being hit by Mario and as a form of attack among the others, this being his unique trait in the game. The GBA remake, Super Mario Advance 4: Super Mario Bros. 3, expands Ludwig's role slightly with the (originally Japanese-only) e-reader level Koopaling Confusion, where he hides out at a docking area for maritime vessels. If the player takes the bottom route to fight Ludwig, he'll fight Mario or Luigi in a flat cabin, and will end up being defeated in one stomp by either of the Mario Bros. However, if the player goes to the end of the armada, they will fight Ludwig in a cabin with an uneven floor, and he will require the usual three stomps to be defeated. His level acts as the penultimate level to the final e-reader level card (counting Bowser's Airship 1 and Bowser's Airship 2 as one level). After he was defeated by Mario, Ludwig was assigned to occupy the fourth castle of Dinosaur Land, located in the Twin Bridges, in Super Mario World. This is the only time in the Super Mario series where he is not the last Koopaling to be fought. During his battle with Mario, Ludwig utilizes a unique combat strategy: spitting fireballs, sliding around in his spiked shell, and occasionally making huge leaps. Mario or Luigi can stomp on him three times, hit him with twelve fireballs, or use a combination of the two methods. After defeating Ludwig, Mario destroys his castle by detonating explosive charges near the bottom of the building, sending it flying into a nearby hill which is subsequently bandaged in the spot where it gets hit. The text that accompanies this suggests that he isolated himself to compose Koopa symphonies, at least until Mario showed up to ruin his work; however, this was added by the localizers, as the original Japanese version uses uniform text for the defeat of all seven Koopalings and does not even use individual names for them. Ludwig is the only Koopaling whose battle is not reused for another Koopaling. 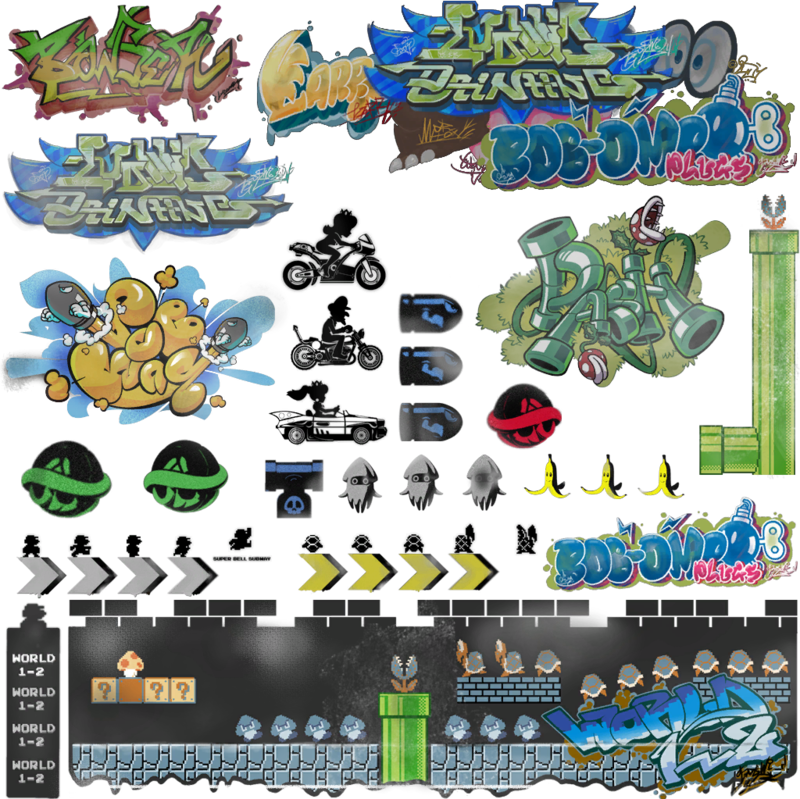 Also, like the others, his in-game design does not match official artwork: in his case, he uses the palette intended for the yellow Koopa Troopas, despite the existence of more appropriate palettes in the game's graphics, such as that used for the green Koopa Troopas, or the teal palette used by Buzzy Beetles and Morton in the cast roll, the latter of which would have matched up with his Super Mario Bros. 3 palette. Furthermore, in the game's cast roll Ludwig uses an alternate color palette, a lighter-skinned pinkish-purple palette with which would fit the shells of Roy Koopa and Wendy O. Koopa as they appear in game, and matched Roy's Super Mario Bros. 3 palette. For unknown reasons, his cast roll sprite depicts him with the same teeth as Morton's teeth. Ludwig and the other Koopalings reappeared in New Super Mario Bros. Wii, after six years of absence, now alongside Bowser Jr. His physical appearance remains relatively unchanged, though Ludwig's shell is now blue instead of green, and he is depicted with blue hair in-game. He first appears in the opening scene, where Ludwig, Bowser Jr. and the other Koopalings jump out of a cake at Princess Peach's birthday party. They trap her inside it by throwing the cake on her. They then flee on their Airship. Mario, Luigi, Yellow Toad, and Blue Toad travel through the Mushroom Kingdom to defeat them, as well as Magikoopa and Bowser, and save Princess Peach. He appears as both the fortress and castle boss of World 7. The stage for the fortress battle is a straight ground with a pit on both sides. When he sees Mario, he will look away and snicker. When battling him at his tower, before reaching him, he conjures a blue fireball from his wand which slowly homes into the players. He is the fastest to cast a spell out of all the Koopalings. After that, he then jumps really high and Flutter Jumps above them whom he is trying to stomp on. After landing, Ludwig then conjures another homing fireball if he is not stomped on. When jumped on, Ludwig retreats back to his shell and spins it to the left and right of the stage in an attempt to hit the players (accompanied by his homing fireballs if it has not made contact with anything yet). When he is stomped on 3 times, he is defeated and retreats to his castle. The stage for the castle battle is three separate, rising platforms which Magikoopa activated with his magic. The platforms rise up and down during the fight and the sides move in unison while the middle does not. Falling between the spaces between the platforms results in losing a life. It is strongly noted that the characters do not get affected by the platforms rising (the players jump normally as if the platforms aren't even rising at all, only the background moves). In the castle, unlike the tower battle, his fireballs no longer home in, but instead they split into four and it takes more time to cast them. 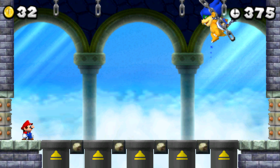 He uses his Flutter Jump ability to get to another section of a platform. Players can tell in which platform he is going to land due to his legs being visible in the screen, Flutter Jumping for a few seconds before landing. When Ludwig is hit, he slides around in his shell, but he will only slide on the platform he is on, rather than sliding to another platform. He also spends a very limited amount of time in his shell. When he is hit two times, he shoots out another four fireballs after he casts his first set of fireballs. When finally defeated, Ludwig falls off-screen and Mario gets the key to World 8. If Mario hits Ludwig at a certain angle the third time, both Mario and Ludwig fall into the abyss, causing Mario to lose a life. Although Ludwig fell during his castle battle with Mario, he later is seen along with the other Koopalings getting Bowser back up, only to have Bowser's castle fall on top of all of them. Ludwig is one of the only two bosses fought in the same order as Super Mario Bros. 3 (the other being Larry, who was the first one Mario fought in both games). Ludwig has an audible voice in-game for the first time. He is portrayed by Mike Vaughn, who gives Ludwig a much deeper voice than the cartoon series' actor. 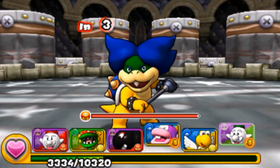 Ludwig, alongside the other Koopalings, reappears in New Super Mario Bros. 2. He is the World 5 castle boss. He'll once again look away and snicker before battling Mario. In his battle, Ludwig uses his Flutter Jump ability to grab one of the five chains hanging from the ceiling to attack Mario with three blue fireballs, while Mario has to use the five gray pipe cannons on the floor to blast himself against Ludwig fast enough. After that, Ludwig falls onto the floor and gets dizzy. Then Mario can jump on his head. After stomping him once, he starts to shoot four fireballs. After two stomps, the chain Ludwig hangs on starts to swing, making it harder for Mario to hit him but still shoots four fireballs. After another stomp, Ludwig is defeated, leaving the key to World 6. Ludwig rejoined his companions at Bowser's castle, where they attempted to petrify Mario with their Koopa Clown Car's petrification device. He also aided Bowser alongside the rest of the Koopalings by causing him to grow larger, but it resulted in him and the others being knocked into a lava pit by Bowser due to his increased size. He and the other Koopalings survived, however, and attempted to help Bowser by airlifting him with the Koopa Clown Car, but this resulted in it crashing due to it being unable to handle the combined weight of both them and Bowser. Ludwig was some distance away from the crash site with his head down, apparently sulking. Ludwig, along with the rest of the Koopalings, Bowser Jr., and Bowser, appears in the Wii U game New Super Mario Bros. U and its Nintendo Switch port, and serves as the final Koopaling boss to be fought, specifically in the world Meringue Clouds. He once again turns and snickers before battling Mario. His boss battle, like Larry and Iggy's, involves him using his magic wand, and like Roy Koopa, his battle takes place in the crow's nest. In battle he levitates in the air while making two clones of himself, and all three Ludwigs will blast fireballs at Mario before dropping onto the ground. If one of the clones is jumped on, it will simply disappear. There are four ways to find out which is the real one. The one that is the real one fires three fireballs, while the clones fire two. The clones keep their eyes half-open, and tend to assume the real Ludwig's pre-battle idle pose while not levitating. The real Ludwig will also drop to the ground last, after the clones, as well as laugh while dropping. Finally, Mario always looks at the real Ludwig if he can see him directly, just as he does with the other bosses. When the fight starts off, after shooting their fireballs, the clones disappear before landing. After the first stomp, the clones do not disappear. After the second stomp, not only do all three Ludwigs shoot faster, but swap positions, though the real Ludwig still shoots three fireballs. After being stomped on three times, Ludwig falls out of the crow's nest and off-screen, and his airship is destroyed by Mario. He is last seen hanging from Bowser's tail along with the other Koopalings as they all fly away on Bowser Jr.'s heavily damaged airship at the conclusion of the game. Ludwig has his own personalized airship, with his face as the bow, and his blue-colored shell at the top. The stern of his ship has a green color design, similar to his former shell color from past appearances. Like most of the airships, Ludwig's airship is equipped with a propeller at the back of his ship as well as another one placed just beneath the crow's nest. The airship is equipped with two cannons, one on each side. There are also orange lids on top of the cannons used for closing and opening the cannons. The airship has a unique feature. The hull is rimmed with green, and there is a balcony-like platform at the base of its mast. Like Roy, the interior of Ludwig's ship is unknown since the player never gets the chance to enter the cabin and instead fights Ludwig at the crow's nest. Additionally, in the fastest possible route to complete New Super Mario Bros. U, Ludwig is the only Koopaling that needs to be fought. Strangely, one of Ludwig's laughs is higher-pitched than his normal voice. Ludwig and the other Koopalings return in New Super Luigi U. Like the other bosses, Ludwig is fought in the same way and the same world as in New Super Mario Bros. U. He is the boss of Ludwig's Block-Press Castle. The Koopalings were featured in the Amada Anime Series: Super Mario Bros., a set of three Japanese OVAs. 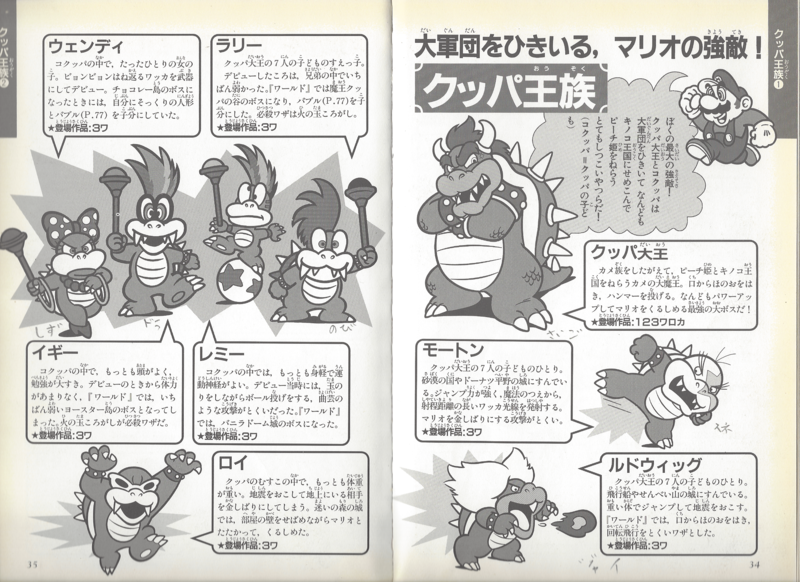 In the Mario retelling of the story "Momotaro", Ludwig and the other Koopalings appear as minions of Bowser, aiding him in abducting Princess Toadstool. In "Shirayukihime" (or Snow White), the Koopalings also appear in similar roles; Ludwig ends up being beaten by Mario like the other Koopalings. Ludwig appeared in the interactive Anime adaptation of Super Mario World. On Chocolate Island, he, alongside Lemmy, Wendy, Larry, Morton, and Roy, ambushed Mario and Luigi at a fortress. He alongside his brothers fought Mario after Wendy nearly fell into lava, but Mario broke open a red block to get a Cape Feather and sent them flying. Ludwig also appears prominently in The Adventures of Super Mario Bros. 3 and the Super Mario World cartoons produced by DIC Entertainment and Nintendo. Here, Ludwig is portrayed as having a mad scientist-like personality, inventing various gadgets for his father. In the cartoons, Ludwig is renamed Kooky von Koopa and has very messy hair, is smaller in size, has only one spike on his shell, has a usually twisted or crooked tail, possesses an unusual laugh, his eyes are larger and has a vague Germanic accent. In the Super Mario World cartoon, Kooky appeared exactly the same with the exception of the episode The Wheel Thing, where his snout was colored the same as the rest of his body. His silent appearance in Rock TV colors his snout a lighter shade, as in The Adventures of Super Mario Bros. 3. Kooky is voiced by Michael Stark. 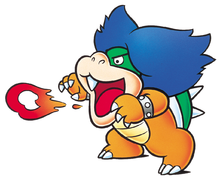 Ludwig appears in the Nintendo Comics System's story Bowser Knows Best, and the Super Mario Adventures comic, where he and his siblings aid Bowser in his attempt to marry Princess Peach. Here, he is portrayed as the most cynical of the Koopalings, disbelieving that Princess Peach would ever agree to marry his father. He is also in charge of communication with Bowser through their television. He makes another short appearance in the Club Nintendo comic "Super Mario: Erholung? Nein, danke! ", where he works as a mechanic for KoopAir. The plane he is working on takes off before he even finishes his work. In Leaping Lizards, either Ludwig or Larry compete alongside five of their siblings in the International Mushroom Games. In Koopa Capers, Ludwig and his brothers have their wands stolen by Wendy, who disappears with them shortly afterward, intent on overthrowing their father with her own army, and a super wand she intends to create by fusing her own wand with her brothers'. If Luigi, who had been coerced by Bowser into searching for Wendy, tracks the female Koopaling down to her hideout, Bowser and male Koopalings, who had been following him, will barge in after the plumber, but decide to stave off punishing Wendy for her mutiny if she helps search for the hiding Luigi. If Luigi had acquired Boom Boom's socks earlier in his adventure, he can toss them into Wendy's simmering wand combination potion, which will release fumes that knock the entire Koopa family and their minions out for at least a week. In Pipe Down!, Ludwig appears as the main antagonist, having set up a base (complete with a giant pipe organ, stage and Piranha Plant string quartet) in a chamber in Pipe World. After his family refuses to have any part in his new basketball-themed opera, Dribbling Beauty, Ludwig sends a pair of enchanted sneakers to Princess Toadstool, disguised as a gift for her ninety-ninth (in mushroom years) birthday. Once the princess puts the sneakers on, Ludwig has them bring her to his lair by playing his organ; once the princess is in his clutches, Ludwig forces her to take the starring role of the Prima Slamdunkerina in his opera, which he intends to show all over Dark World as a part of nine-year tour. In the book's best ending, Mario and Luigi track Ludwig down, destroy his organ, and cause most of his lair to collapse, an act that actually has the beneficial effect of curing Ludwig's partial deafness. While distracted by his newfound ability to hear with perfect clarity for the first time in fifteen years, Ludwig is knocked out when the princess throws a basketball at his head. Ludwig, as seen in the SNES version of Mario is Missing! In Mario is Missing!, Ludwig, along with a few of the other Koopalings, invades Earth with Bowser as part of a plot to flood the world by melting Antarctica. Guarding a corridor of Bowser's headquarters, Ludwig battles Luigi, who plans on stopping Bowser's plot and saving the kidnapped Mario. He is the last Koopaling encountered in the MS-DOS release, while he is the first in the Super Nintendo Entertainment System release. 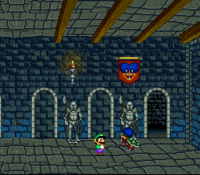 In the latter, Ludwig appears when Luigi arrives back at the castle after clearing the last of the first floor's cities. Ludwig runs around the castle like mad; however, like the other bosses in the game, he cannot harm Luigi, simply running past him instead. Once Luigi jumps on Ludwig a total of six times, he disappears in a puff of smoke. Defeating Ludwig in combat enables Luigi to move on. In the former, he obstructs Luigi's path while conducting a baton to an unheard beat. Like the others, all he can take is a fireball. He does not appear in the NES release, like the other Koopalings. The Koopalings later help Bowser conquer Jewelry Land in the game Yoshi's Safari. Ludwig occupies the Mushroom Land region of Jewelry Land. 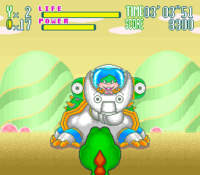 In battle, Ludwig uses a large robot with four legs, a spiked shell and a retractable head (in which Ludwig himself is stationed). Two cannons are attached to the head. The robot's weak spot is a large red area which Ludwig normally guards with the robot's head. However, as he has to move while he shoots, the red spot often becomes temporarily visible, allowing Mario to destroy it. After the robot explodes, the pieces salvage themselves together into a fighter style mech, which has fists that fly off to attack Yoshi and Mario. Once this robot is also destroyed, Ludwig concedes defeat. In Hotel Mario, Ludwig appears as the boss in Ludwig's Thump Castle Hotel in Ludwig's Frantic Lab. In this game, Ludwig displayed the previously unseen ability to teleport and shoot blast of lightning from his hands. Ludwig is slow and primarily changes floor via teleportation, though he will take the opportunity to take Mario or Luigi in an elevator if he comes across them. If this happens, he shows no mercy and puts a gluttonous end to them, though at least he has the dignity to keep their cap in his stomach. 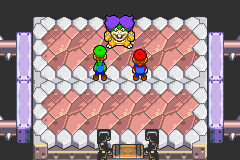 Despite these new powers, Ludwig is still defeated by the Mario Bros.
After years of absence, the Koopalings finally made a reappearance in Mario & Luigi: Superstar Saga, acting as guards in Bowser's Castle during Bowletta's invasion of the Beanbean Kingdom. He is the fourth Koopaling to be fought, like in Super Mario World. Ludwig attacks the Mario Bros. by moving inside his shell, which they have to jump over quickly. However, Ludwig sometimes fakes the brothers out. Afterwards, Ludwig jumps into the air. Mario and Luigi, confused, attempts to leave the room, only for Ludwig to return, roar angrily at the Mario Bros., and proceed to rush to attack them. Like in Super Mario World, the Koopaling attacks Mario and Luigi by shooting balls of fire and zooming around in his shell, as well as a spinning attack like Iggy. Defeating him lowers the spikes preventing Mario from hitting a switch, raising a platform and allowing the Mario Bros. to continue to Roy. In Mario & Luigi: Superstar Saga + Bowser's Minions, his battle is changed significantly, in addition to him now having dialogue. The battle itself is similar to that of Shrowser from Mario & Luigi: Partners in Time and Thunder Sass from Mario & Luigi: Dream Team, as Ludwig does not let the bros. attack. Ludwig will create a giant ball of magic and shoot it into the air, which slowly comes down on a brother. As the orb falls, Ludwig will fire smaller blasts from his wand, which need to be blocked by hitting them with the bros.' hammers. Once the giant ball gets low enough, the targeted brother must hammer it to make it fly back into Ludwig, instantly knocking him out, ending the fight. Ludwig also appears in the added on alternate story mode Minion Quest: The Search for Bowser as a Ranged-type ally. He first appears on the Hoohoo Mountain where he and Lemmy try to find Bowser together after Fawful attacked the flying Koopa Cruiser and made it explode. Later, he and the other Koopalings get brainwashed by Fawful and try to conquer the Beanbean Kingdom afterwards. Ludwig is returned to normal after the player defeats him in Bowser's Castle. His stats spread includes having high POW and DEF, but his strength mostly lies in DEF. Ludwig reappears in Mario & Luigi: Paper Jam. He first appears in Doop Doop Dunes with Larry, Wendy and Roy where they capture Mario, Luigi and Paper Mario. In the Twinsy Tropics Dungeon, as Mario & co. head to the pipe that leads them to Bowser's Castle, they are stopped by Larry and Ludwig, telling them they need a pass to enter. 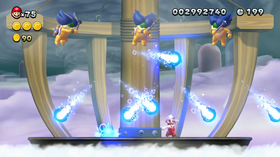 Ludwig and Larry then briefly attack the Mario gang inside the pipe until Starlow unleashes a "Supernova Sparkle" attack. Afterwards, Ludwig and Larry exit out of the pipe and proceed to fight Mario & co. Ludwig and Larry are quickly defeated and forced to retreat. Ludwig is encountered one last time on top of Neo Bowser Castle, alongside the rest of the Koopalings. Ludwig briefly claims that he is a leader, to which the other Koopalings deny and as Ludwig attempts to explain what they are as a group, he realizes that he should be focused on beating Mario and gets ready for combat. Ludwig and Larry then battle Mario & co. one last time. After the battle, Ludwig utters some last words, saying that he has been dethroned, just before exploding. In both of the boss battles against Ludwig and Larry in the main story, Ludwig draws Battle Cards from his deck, one at a time. In order to use them, he and Larry must collect Dark Star Points by successfully damaging Mario, Luigi, and Paper Mario. The Battle Cards are drawn in a specific order and when the last card is used, Ludwig begins the cycle again by drawing the first card. When both Koopalings attack, Ludwig always makes the first move. They either retreat in their shell and attack the Mario Bros. first and then Paper Mario, or they try to hide behind a giant bomb that some Shy Guys try to deliver to the Bros., or they attack with their magic wand. In the latter case, Ludwig always attacks the Mario Bros. When both of them are defeated, he doesn't attack and sticks to using his Battle Cards. Like Larry, Roy and Wendy, he creates giant magic fireballs with his wand when he is fighting alone and does not gain Dark Star Points anymore. Ludwig and Larry are also summoned by Dry Bowser in the Boss Battle Ring after Wendy and Roy have been defeated, in this case however the two Koopalings do not gain Dark Star Points and Ludwig no longer uses Battle Cards. 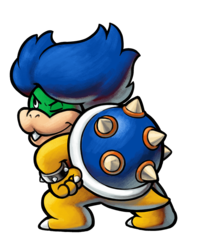 Artwork of Ludwig von Koopa from Mario & Luigi: Bowser's Inside Story + Bowser Jr.'s Journey. 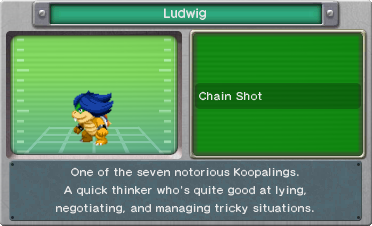 Along with the other Koopalings, Ludwig appears in the game's new side story. He is one of two Koopalings to not be fought, the other being Lemmy. 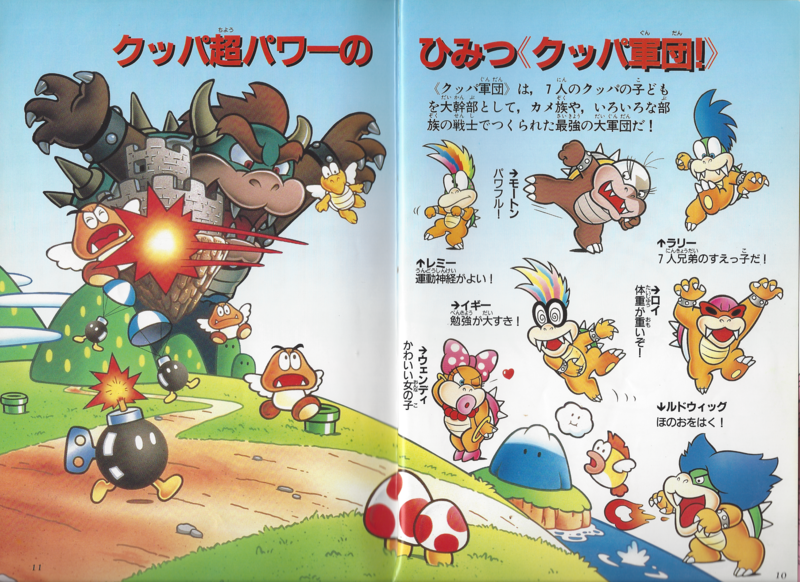 In the beginning, as a test to see Bowser Jr.'s fighting abilities (largely due to Bowser Jr. deciding to just travel with a Mechakoopa over finding the actual ingredients for the blorbs), has Captain Goomba, Captain Koopa, Captain Boo, and Captain Shy Guy fight Bowser Jr. At Dimble Wood, he also grew suspicious that someone was watching him, and also had gnawing concerns that something bad was happening at Bowser's Castle, and departed the group to investigate. Because of this, he was one of only two Koopalings to have not left as a direct result of Bowser Jr.'s behavior (the only other being Morton Koopa Jr., who ended up brainwashed by the BFFs). Ludwig eventually managed to pose as Beef after tricking him with a decoy and then locking him in a storage room while crafting his disguise afterward, consequentially also learning key details about the BFF's plans, though he was forced to knock Iggy off a cliff to remain in-character in front of his "allies." He eventually reveals himself, with his admitting he deliberately used himself as bait to lure Kaley into a trap. In the ending, Ludwig and Bowser Jr. proceeded to pose with each other during the resulting festivities of the defeat of Fawful's forces. Ludwig von Koopa, alongside the rest of the Koopalings, appears as a playable character for the first time in Mario Kart 8, where he is an unlockable character. This time, he is voiced by David J. Goldfarb who gives Ludwig a higher pitched voice instead of Mike Vaughn. His nickname in a Japanese Nintendo Direct for Mario Kart 8 is ｢目立ちたがりの悪役ヒーロー」, or "Showoff Villain-Hero" (localized as the "Conductor of Chaos" or "Showy Anti-Hero"). Just like Bowser and the other Koopalings, his emblem is shown to be a deep blue silhouette of his own head on a black background. Ludwig is a middleweight racer, giving him relatively balanced attributes for most of his stats. He is used for the Staff Ghost for 3DS Piranha Plant Slide, making it a reference to Ludwig being the boss of Pipe Land in Super Mario Bros. 3. Ludwig also has a business which appears as a sponsor in this game called Ludwig Painting. Ludwig's main color for his Standard parts and Pipe Frame is his signature blue, and his secondary color is green. The color scheme selection of his other parts is also based on blue, making it similar to that of Blue Miis. Exceptions to this are his Sneeker and Sport Bike. Ludwig returns in the Nintendo Switch port Mario Kart 8 Deluxe, this time available from the start. He shares stats with only Mario and medium Miis. Appears from the background in his Junior Clown Car and gives a mocking gesture. Ludwig (alongside the other Koopalings) makes his Super Smash Bros. debut as a playable character accessible via Bowser Jr.'s alternate costumes in Super Smash Bros. for Nintendo 3DS and Super Smash Bros. for Wii U. He is unlockable in the former game and available from the start in the latter. His attacks and statistics are identical to Bowser Jr.'s, though he is referred to by his own name by the announcer and has his own voice clips. Ludwig can also appear in place of Bowser Jr. in All-Star mode (like the other Koopalings). Like the other Koopalings, he is actually driving a mass-produced version of the Junior Clown Car (as noted by the yellow light bulbs that serve as its eyes). The rim and propeller of his Junior Clown Car are colored blue (his signature color). He also reuses his voice clips from his appearance in New Super Mario Bros. Wii, thus he is voiced by Mike Vaughn. The title given to Ludwig in the Boxing Ring is "Pompous Prodigy" in the Wii U version. In Super Smash Bros. Ultimate, Ludwig (alongside the other Koopalings) returns as a playable character accessible via Bowser Jr.'s alternate costumes. He is once again an unlockable character, like in Super Smash Bros. for Nintendo 3DS. Just like in the previous game, his attacks and statistics are identical to Bowser Jr.'s, though he is referred to by his own name by the announcer and has his own voice clips. 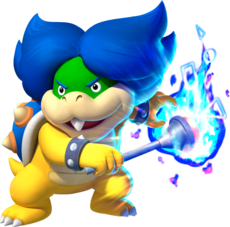 Unlike in Super Smash Bros. for Nintendo 3DS / Wii U, all seven Koopalings (Ludwig included) now use their magic wands for any occasion where Bowser Jr. would use his hammer. These occasions include all corresponding attacks, their side taunt, and one of their victory poses. Ludwig appears in Puzzle & Dragons: Super Mario Bros. Edition as a Fire attribute character. He's the World 7-Castle and World 7-Airship Boss. Ludwig will join the player when ★World 7-Airship is completed. His Skill is Ludwig's Volcano, which changes all Orbs into Fire Orbs. Ludwig makes his first playable appearance in the Mario & Sonic series, not counting his Mii costume in both Mario & Sonic at the London 2012 Olympic Games and Mario & Sonic at the Sochi 2014 Olympic Winter Games, in Mario & Sonic at the Rio 2016 Olympic Games. In the Nintendo 3DS version, Ludwig is only playable in Table Tennis. He is the only Koopaling to be a default character. He is shown to be high in skill, and average everywhere else. Ludwig does not appear in the Wii U version, but the aforementioned costume based on him returns. Ludwig makes his Paper Mario series debut in Paper Mario: Color Splash. He appears in Fort Cobalt, where he battles Mario on his warship, the "Super Ludship". In the battle against him, the projectiles fired by the warship's cannons can be tossed back using the Tail Card. After the first hit, Ludwig orders two Koopa Paratroopas to come and help him, if they are defeated but the ship is not further damaged, two more Paratroopas come at the beginning of each turn. After the ship is damaged two times, Ludwig orders two Spikes to help him, those Spikes immediately draw out spiked balls to be thrown at Mario and stay on the ship; for this reason they cannot be directly attacked by Mario, who is forced to use that Tail Card to toss the spiked balls back at them. Furthermore, the damaged cannons fire a projectile with a low trajectory, causing it to roll on the floor before reaching Mario. When Ludwig’s warship is hit three times by its projectile, it sinks and Ludwig ends in the water and goes into his submarine, the Super Ludsub, which can fire missiles. Using the Balloons Thing Card, the submarine can be carried out of the water and onto the fort’s floor. However, if a Replica of the Balloons is used, Ludwig will fire a missile at the Balloons Replica, rendering it useless. If Mario doesn't use the Balloons, Ludwig will attack with one missile. On the next turn, Ludwig won't attack. On the turn after that, Ludwig will end Mario with a "Meteor Missile Storm", sending out 6 missiles, each dealing 35 HP of damage. The first one can be blocked or deflected with the Tail, the rest are unavoidable. If the attack connects, Mario will be instantly defeated. If Mario uses the Balloons but doesn't attack the Super Ludsub, the balloons will eventually pop, the submarine will fall on the floor and Ludwig will start attacking again with missiles, although this time he apparently doesn't try the Meteor Missile Storm, attacking instead with one missile at a time. When Mario destroys the submarine, Ludwig takes a lot of damage and fights on his own by spinning his shell, sometime attacking just one time per turn, sometime two times, by spinning while coming back after the first attack. After the battle, he admits defeat and his minions hand over the blue Big Paint Star. In the game code it is revealed that the Super Ludship too is supposed to have a final attack that instantly defeats Mario, the Lud-Cannon Blast, that is hinted by Ludwig, likely a few turns before, with a sentence that implicitly suggests the player to use the Tail Card. Acording to the game's data, the Super Ludship would fire many projectiles dealing 25 HP of damage each, however in the final game, there doesn't seem to be a way to trigger the event that leads to said final attack. Among the Koopalings in Paper Mario: Color Splash, Ludwig is the only one who specifically says that he has operated on his own: desiring to fight the world-famous Super Mario at least once, he used the blue Big Paint Star to lure Mario in his base. Ludwig's appearance in the game is largely based on his artwork used in the Encyclopedia Super Mario Bros. and in other material released for the 30th Anniversary of Super Mario Bros.. As such, not only does he have black eyes, like many other paper characters, his eyebrows are black instead of being blue. His initial pose while he introduces himself is also derived from said artwork. At the beginning, when he's in the dark, his eyes also display eyeshine. Ludwig was originally going to appear in Super Princess Peach, although he was taken out of the final game with the rest of the Koopalings. It appears that he could breathe fire like in Super Mario World, and that he could cackle haughtily. Since Super Mario Bros. 3 appears in NES Remix 2, Ludwig von Koopa appears as a boss in some stages along with the rest of the Koopalings. In the Super Mario Mash-Up Pack in Minecraft, Ludwig von Koopa appears as a playable skin along with the rest of the Koopalings. Ludwig is included (along with the other Koopalings) as a Boss in the Boss Deck of Monopoly Gamer. He is the seventh Boss in the deck. While Ludwig and the other Koopalings do not appear in Mario Tennis Aces, their airships can be seen in the background of the Savage Sea court. 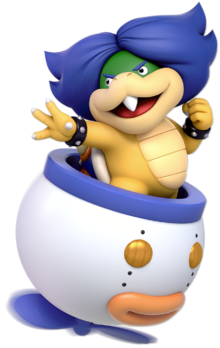 The current appearance of Ludwig von Koopa in the Encyclopedia Super Mario Bros.
Like the other Koopalings, Ludwig has yellow and tan skin and a green head. He also has a four-ribbed, plated belly and padded feet, wears the same metal, spiked cuffs as the other male Koopalings and he's average in height, being taller than Lemmy, Larry and Wendy but shorter than Roy, Iggy and Morton. With earlier official material showing him as shorter than Mario, Mario Kart 8 shows that he is still shorter than most of the other middleweight characters, but, much like the other Koopalings, varies in height between games. Ludwig's shortest modern appearance is in the 3DS version of Mario & Sonic at the Rio 2016 Olympic Games, and his tallest is in Paper Mario: Color Splash. His facial features are defined, having shaped cheeks, a high nose, a low jaw, and deeply curved lips with a complete set of teeth as revealed by Super Mario Adventure Game Picture Book 2: Mario and Baby Yoshi (「スーパーマリｵぼうけんゲームえほん 2 マリオとチビヨッシー」), Super Mario World, when leaping during his boss fight, and Mario & Luigi: Paper Jam. He has a round head and small, circular gray eyes, like Morton. Paper Mario: Color Splash also reveals that his eyes present the tapetum lucidum, as eyeshine can be seen when he's partially in the dark while entering the room on his Super Ludship. The traits that differentiate Ludwig from all the other Koopalings are his single overbite on upper center of his snout and large, wild, blue hair, with an hairstyle similar to that subsequently used for Flurrie. He also has small, blue eyebrows, typically kept at an angle to confer him a serious tone. Ludwig's sprites in Super Mario Bros. 3 and Super Mario World show him with white hair due to technical limitations. Similarly, his shell in Hotel Mario is gray-colored. His redesign in New Super Mario Bros. Wii brought minor changes to his appearance. The eyebrows became blue instead of black and Ludwig's shell became blue with light orange rings surrounding the multiple, short spikes instead of green without rings around the spikes. In the Super Smash Bros. series, Ludwig's appearance is mostly unaltered compared to the other Mario characters, including Bowser. In Super Smash Bros. Ultimate, however, Ludwig receives a slightly darker and subdued color scheme, while his hair, spikes, and shell receive simple detailing, though his scales remain undefined. These traits are shared with Bowser Jr. and the other Koopalings. 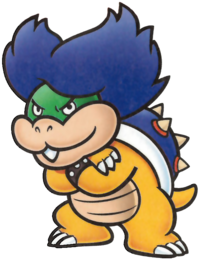 Ludwig is known to be the eldest of the Koopalings; he is said to be precocious and conceited, In Mario and Luigi: Superstar Saga, he gets enraged when ignored by Mario and Luigi, a trait also seen in Super Mario Wisdom Games Picture Book 3: Luigi's Secret (「スーパーマリオちえあそびえほん 3 ルイージの ひみつ」). The same book also displays him as being somewhat of a show-off, both when he introduces himself and when he chases Mario. This latter trait can be also noted when he introduces himself in Super Mario Adventure Game Picture Book 2: Mario and Baby Yoshi, as well as when he performs an impressive display of flips and twirls when riding in bikes or karts in Mario Kart 8, and has been eventually confirmed in his trophy description in Super Smash Bros. for Nintendo 3DS. In the New Super Mario Bros. series, Ludwig laughs off the threat posed by the Mario Bros. when they face him in his castle, suggesting he underestimates Mario, a trait he himself starts to acknowledge after being defeated in Paper Mario: Color Splash. In Mario & Luigi: Paper Jam, after Wendy and Roy's defeat on top of Neo Bowser Castle, Ludwig stated that he was not impressed by their battle. His next words suggest that he thinks of himself as the Koopalings' leader, although the other Koopalings deny this. He also stated himself to have been "dethroned" after losing to Mario, Luigi, and Paper Mario. In the English localization of Paper Mario: Color Splash, he is the only Koopaling to be referred to by his minions as "Your Evilness," a title similar to the ones given to Bowser; in the Japanese version, however, such title is absent. Regardless of his title, in both versions Ludwig is the only Koopaling explicitly stating to have worked just to fight Mario at least once rather than to fulfill Bowser's plans and shows a more humble and respectful attitude when suffering defeat, contradicting previous arrogant depictions. This tendency to act on his own and his secretly humble and respectful attitude slightly matches his Japanese and US blurbs in Mario Kart 8 that call him a "Showoff Villain-Hero" and "Showy Anti-Hero" respectively, and is further confirmed in Bowser Jr.'s Journey where all alone he defeats Beef, one of the Best Fitness Friends, and disguises as him, setting up a trap that nobody else is aware about, not even Kamek or Bowser Jr., only to then say to Bowser Jr., after having revealed his deeds, that he accepts any punishment for what he has done. On the other hand, he has also been portrayed as the most cynical of his siblings, as he expresses disbelief that Princess Peach would ever agree to marry his father in the Super Mario Adventures comic. In the DOS version of Mario is Missing!, he cracks a joke about light bulbs and darkness at Mario's expense after Bowser discovered the hero's fear of the dark. He also had a horror-themed hotel in Hotel Mario. Another aspect of Ludwig, not found both in Japanese in-game text and Japanese bios, is his love of classical music and his interests in composing. He waves a conductor's baton in Mario is Missing! and his UK blurb in Mario Kart 8 calls him the "Conductor of Chaos". His bio from the Mario Kart 8 Prima Guide says that he plans to compose his own victory theme should he win the race, and both the Nintendo Comics System and the English version of Super Mario World reveal that he enjoys composing "Koopa Symphonies", although the former goes on to state that they sound horrendous. The book Pipe Down! implied that he was at least partially deaf for a time, as he claims he can finally hear after an explosion "shook something loose in [his] brain". In the 3DS version of Mario & Sonic at the Rio 2016 Olympic Games, his victory animation when he ends up in 2nd or 3rd place has him performing a stationary march, revealing his sense of rhythm. The first game that has lines of dialogue from him specifically related to classical music is the English localization of Paper Mario: Color Splash, where he says that "the first movement begins," as the battle begins, and calls the cannons of his warship "Cannon in Sea Major," with the Italian localization stating in a more direct way that he's a composer. According to graffiti of his hair and the list of the points of interests in Super Bell Subway, Ludwig might also be into art, as there's a place called "Ludwig Painting," also mentioned in the graffiti. In Ludwig's trophy description in Super Smash Bros. for Nintendo 3DS / Wii U, he is considered the most intelligent of the Koopalings, in Paper Mario: Color Splash he even designs his own warship to fight Mario, that he doesn't manage to fully produce before the latter arrives. He has been given the role of an inventor also in other media, such as the Club Nintendo comic Super Mario: Erholung? Nein, danke!, where he works as the mechanic for the KoopAir airline service. 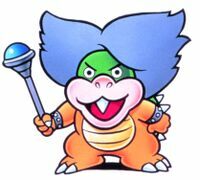 In The Adventures of Super Mario Bros. 3 and the Super Mario World cartoon, Ludwig's name was changed into Kooky von Koopa, and was portrayed as a stereotypical mad scientist, whose main purpose was to invent new doomsday weapons and gadgets for his father. He would commonly burst out into maniacal laughter or raise his voice by shouting in the middle of talking and seemed to be very aggressive towards the Mario Bros. Kooky didn't also care much about his hygiene, never washing or combing his hair. By contrast, the comics give him a more refined personality and vocabulary. In Bowser Jr.'s Journey Ludwig is shown to be somewhat serious and astute regarding sensing off elements, as evidenced by his sound suspicions that someone was watching and stalking them, and that something very bad has happened to Bowser's Castle, and his promptly leaving the party to investigate. His intelligence and knack for strategy was further showcased when he defeated Beef: Knowing full well he did not stand a chance against him in a fair fight, he instead outsmarted Beef by leaving behind a mannequin in Ludwig's likeness and tricked him into shoving it into lava while promptly disposing of Beef from behind via shoving him into the same lava pit, and then creating Beef's costume to replace him. Ludwig was given a stereotypical German accent in both the official Nintendo Power strategy guide for Super Mario Bros. 3 and the CD-ROM Deluxe edition of Mario is Missing!, along with maniacal laughter not indicated in the speech bubbles in the latter source. In the Italian version of Paper Mario: Color Splash he even leaves Mario speaking in German. Interestingly, he seems to have a very laid-back tone in the original Japanese Super Mario Bros. 3 manual, having some eccentric "cool musician" mannerisms and even using the first-person pronoun 「おいら」 oira (highlighted in katakana as 「オイラ」), a version of 「おれ」 ore with rural connotations. 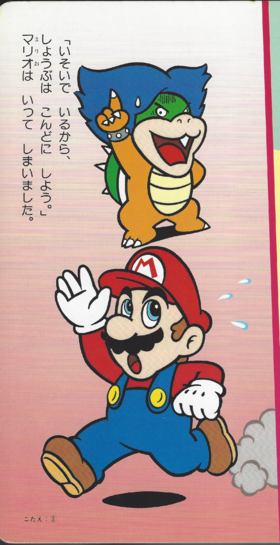 In the Super Mario Picture Books , he uses the arrogant term 「おれさま」 ore-sama to refer to himself; said term, along with the strong but less arrogant 「オレ」 ore, is also used in the Super Mario-Kun manga. He usually uses as his second-person pronoun 「オマエ」 omae, however, in Paper Mario: Color Splash, he instead uses 「キミ」 kimi. Ludwig is usually portrayed as the most talented and powerful of the Koopalings. In Super Mario Bros. 3, Ludwig shared his attack pattern with Roy; Ludwig could fire projectiles from his magic wand, pound the ground to stun the Mario Bros., and retreat in his shell for both defensive and offensive purposes. Although all the Koopalings in Super Mario Bros 3 frequently retreated into their shells when stomped on by the Mario Bros. Ludwig was the only one of the Koopalings to demonstrate doing so at will, without having to be hit by the Mario Bros. He was given a completely unique attack pattern in Super Mario World, which none of the other Koopalings shared; Ludwig could spit three fireballs in a row and spin around the room in his shell, after which he could perform a long jump to the other side of the room. Ludwig was given even more new powers in Hotel Mario: he can fire electricity from his hands and teleport in a flash of lightning. In Superstar Saga, Ludwig retained his previous abilities of breathing fire (though not as furiously as the previous time) and spinning around in his shell, but also learned the new ability of spinning like a tornado to attack the Mario Bros., which was also done by Iggy. In New Super Mario Bros. Wii, Ludwig learned even more new abilities. He can either blast four fireballs from his wand at time or fire a single fireball, each homing in on the player, and has even mastered the ability of Flutter Jumping, being able to stay in the air for several seconds. His appearance in New Super Mario Bros. 2 has him also expanding on these abilities, utilizing the Flutter Jump to grab a chain, and then move between the two, and in addition, he can also increase his rate of fire. In New Super Mario Bros. U, similar to Lemmy and Wendy in Mario and Luigi: Superstar Saga, he was also revealed to create fake duplicates to fake out the Mario Bros. He is also shown with the ability to levitate without needing to Flutter Jump. He's also proven to be more acrobatic than most of the other Koopalings being able to jump large horizontal distance with several flips in Super Mario World. While his appearance in Mario Kart 8 doesn't show his abilities, it is shown he can do a double-flip in the air while performing a stunt. Most of his tricks involve him jumping out of his kart, something he does more than any other characters meaning. His agility is further confirmed in the 3DS version of Mario & Sonic at the Rio 2016 Olympic Games when he ends up in 2nd place or 3rd place, as in his victory animation he is able to stand on his right hand and spin, spanning two complete circles with his spinning. Super Smash Bros. for Nintendo 3DS / Wii U has Ludwig in his own version of the Koopa Clown Car, as he is a "palette swap" of Bowser Jr., just like the other Koopalings. He can shoot cannonballs, use drills, boxing gloves, wrecking balls, and can even jump out of his Clown Car. Mario & Luigi: Paper Jam shows that he has some decks of Battle Cards that are used in the battle against the Mario Bros. and Paper Mario thanks to Dark Star Points that he and Larry collect by dealing damage to their opponents, showing how ingenious Ludwig is. Mario & Sonic at the Rio 2016 Olympic Games shows that Ludwig is very skilled in Table Tennis, which has been known to be a patient and strategic game, perfectly suited to him. Bowser's oldest Koopaling and second in command, he's a real monster! When Koopa's villainous schemes require sheer lunacy, he calls on Kooky. A graduate of Frankenstein University, Kooky loves to construct monsters in his basement lab in Kastle Koopa. He's responsible for many of the new villainous characters in SM3. [sic] He built the Doomship. Kooky never showers or combs his hair. He sleeps during the day, if he ever sleeps at all. Eats nothing but candy and fried foods. A member of the family of Great King Bowser (P26) who has a white mane. When the situation becomes bad, he hides in his shell right away. In Mario World, he reigns as a mid-boss. Since he's a Koopaling, you'll have a bad time if you underestimate him. Jump at the Moment he Lands! In Mario 3, the Koopaling causes earthquakes when he lands, immobilising Mario. Jump to prevent that. Pay Attention to the Fire Balls Ludwig Spits! In World, Ludwig is invincible while he's retracted into his shell, so it's pointless to attack him. The solution is to stomp him at the moment when he comes out to spit fire. One of Great King Bowser's 7 children. He lives in an airship and the castle of Cookie Mountain. He jumps with his heavy body, causing earthquakes. In "World", his special moves are spitting fire from his mouth and a spinning jump. With mad hair and roving eyes, this lunatic turtle has all the abilities of Roy (he can pound the ground), but he improves on this by leaping into the air at a much quicker rate once he’s hit, allowing more frequent attacks. He’s very adept at wand-firing too. Stay on the upper portions of the room, stay in the air as he lands, and then dispatch in the normal manner, finishing Pipe Maze in style! Second in command only to big Bowser, Ludwig von Koopa is the oldest Koopaling. He's also the most vicious. Level 36 Notice: Stats in parentheses are from the game's Easy Mode. Level 46 Notice: Stats in parentheses are from the game's Easy Mode. Minion Quest: The Search for Bowser bio: One of the seven notorious Koopalings. Has a great balance of POW and DEF. 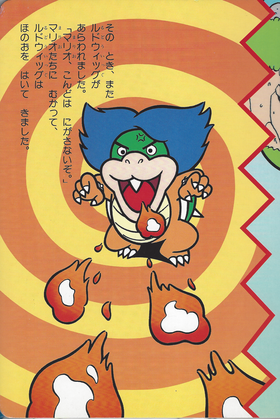 Bowser Jr.'s Journey bio: One of the seven notorious Koopalings. A quick thinker who's quite good at lying, negotiating, and managing tricky situations. A grown up and impertinent one, who is the most intellectual of his comrades? It's possible that dealing with him will not be straightforward. Wii New Super Mario Bros. Wii (11/2009) The cleverest of the Koopalings, easily recognized by his big tufts of hair. He's got a mature air about him, but he likes to show off and can sound a bit pompous. In New Super Mario Bros. Wii, he's the boss of World 7 and torments Mario by firing homing magic blasts and floating too high in the air to be jumped on. The cleverest of Bowser's Minions, easily recognised by his big tufts of hair. He's got a mature air about him, but he likes to show off and can sound a bit pompous. In New Super Mario Bros. Wii, he's the boss of World 7 and torments Mario by firing homing magic blasts and floating too high in the air to be jumped on. Palutena: That's one of the Koopalings, Ludwig von Koopa. Pit: Hmm. The resemblance to Bowser Jr. is strong. Palutena: That Koopa Clown Car is the mass-produced type. Pit: I guess as heir to the throne, Bowser Jr. would get preferential treatment. Viridi: The relationship between Bowser and the Koopalings is a real mystery. Pit: I kind of feel bad for them. Palutena: That's sweet of you but not very conducive to taking them down, Pit. 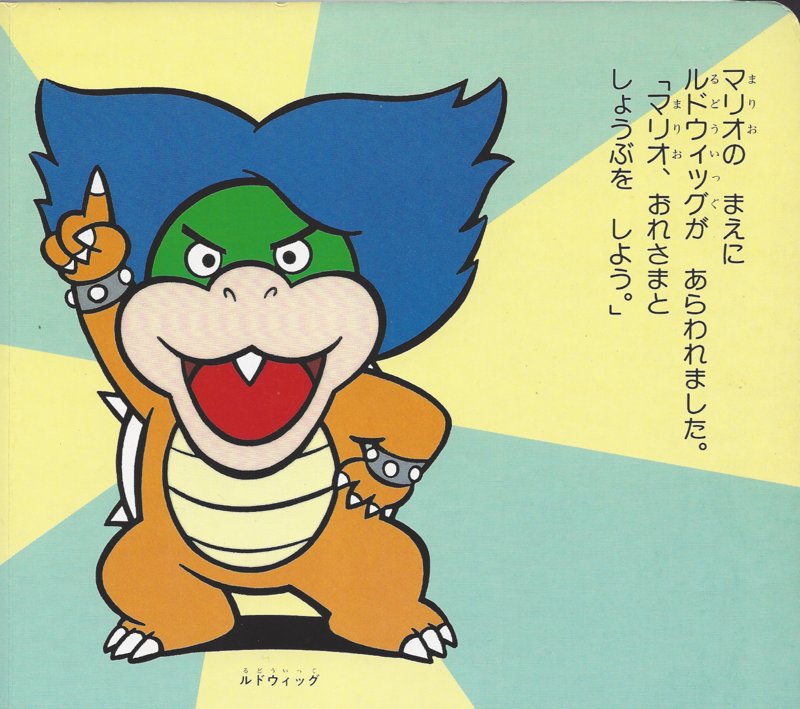 Ludwig's origins - Ludwig von Koopa first appeared in Super Mario Bros. 3, released in North America in 1990. You could call him the brains of the Koopalings. Ludwig's emblems, from Mario Kart 8. Bio: "Ludwig has followed his fellow Koopalings to the races, intending to compose his own victory anthem should he win... which as far as he’s concerned is the obvious outcome." One of the Koopalings. He is an intellectual, and a show-off. His overbite is cute. In his first appearance, he used an attack in which he caused earthquakes by jumping. Quotes Usual: "The first movement begins! I hope you enjoy my Cannon in Sea Major!" ~ "Gwehehe! You think your puny attack is going to damage my Super Ludship? Target: Mario! Fire!" ~ "Ho ho! A counterattack, eh? Aren't we doing well? Prepare tactical auxiliary forward-mounted attack units! Oh, you know what I mean. Queue the dang Koopa Paratroopas!" ~ "Grrrreh! My ship has taken serious damage! Don't think I'm going to let it happen again! BOMBERS! Do your stinking jobs!" ~ "Gyaaahhh! She's going down!" ~ "Gwehehe! This was my plan all along! The Ludship was just a temporary design! Say hello to the flagship of my fleet: the Super Ludsub! Go ahead—just try to attack it. Gwehehe!" ~ "Gwehehe! Get that Replica garbage out of here!" ~ "Gwehehe! Bust out the streamers and blow up the balloons—it's time to celebrate your demise!" ~ "This will LIFT your spirits: I'm going end this battle next turn... BY BLASTING YOU INTO CONFETTI!" ~ "You put up quite a fight, but I'm afraid I must bid my adieu. Here comes my final attack... Meteor Missile Storm!" ~ "Super Ludship, dive! Huh? Dive! DIVE! Why won't you dive?!" ~ "You wrecked my Super Ludsub! HOW DARE YOU!" This is a list of all voice actors of Ludwig von Koopa. For this subject's image gallery, see Gallery:Ludwig von Koopa. Rudowiggu Ludwig, from the English name. Literally means "Cheats" or "Traps"
Rudeuwik Ludwig, from the English/Japanese name. 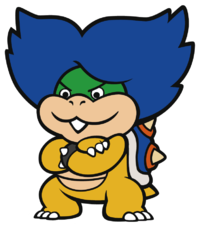 Ludwig is one of only two Koopalings whose placement in birth order was officially confirmed, the other being Larry Koopa. Ludwig allegedly being deaf in the comics is a reference to his namesake, Ludwig van Beethoven, who was known to have been deaf during his later life, resulting in his aides having to physically turn him around during a standing ovation due to his not hearing the applause. According to the Nintendo Power Super Mario Bros. 3 Strategy Guide, Ludwig is a Baron. 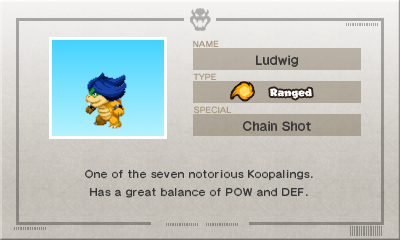 Ludwig, unlike his siblings, has never been the first Koopaling to be fought. ↑ 1.0 1.1 1.2 "Bowser's oldest Koopaling and second in command, he's a real monster!" - Nintendo Power Strategy Guide for Super Mario Bros. 3, page 9. ↑ Nintendo Power Strategy Guide for Super Mario Bros. 3, pages 9 & 72. ↑ Nintendo of Japan (November 12, 2015). マリオ＆ソニック AT リオオリンピック™ トレーラー. YouTube. retrieved November 13, 2015. ↑ Nintendo (August 30, 2016). Paper Mario: Color Splash – Rescue V: Episode 3. YouTube. Retrieved September 7, 2016. ↑ Crunchii. (September 25, 2016). Paper Mario: Color Splash stream. YouTube. Retrieved September 26, 2016. ↑ 1993 Nintendo Character Guide Comparison Chart. Press The Buttons. Retrieved October 14,2015. 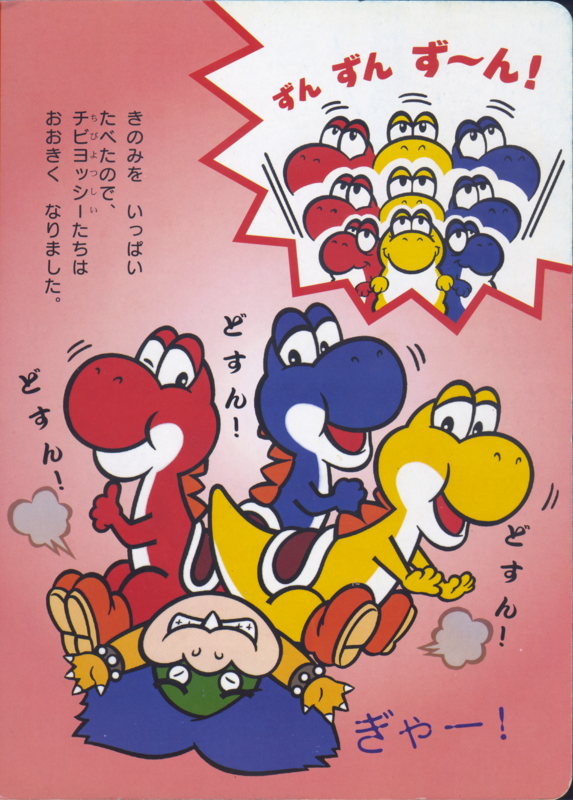 ↑ A red, yellow and blue Baby Yoshi growing into adults, squishing Ludwig von Koopa, in Super Mario Adventure Game Picture Book 2: Mario and Baby Yoshi (「スーパーマリｵぼうけんゲームえほん 2 マリオとチビヨッシー」)Media:SMAGPB2 Yoshi Squishing Ludwig.png Ludwig has a full set of teeth along with the overbite. ↑ NintenU (December 8, 2015). Mario & Luigi Paper Jam Walkthrough Part 35 Ludwig & Larry Boss Battle. YouTube. Retrieved December 13, 2015. ↑ 19.0 19.1 Ludwig challenging Mario in Super Mario Wisdom Games Picture Book 3: Luigi's SecretMedia:SMWGPB3 Ludwig OreSama.png. 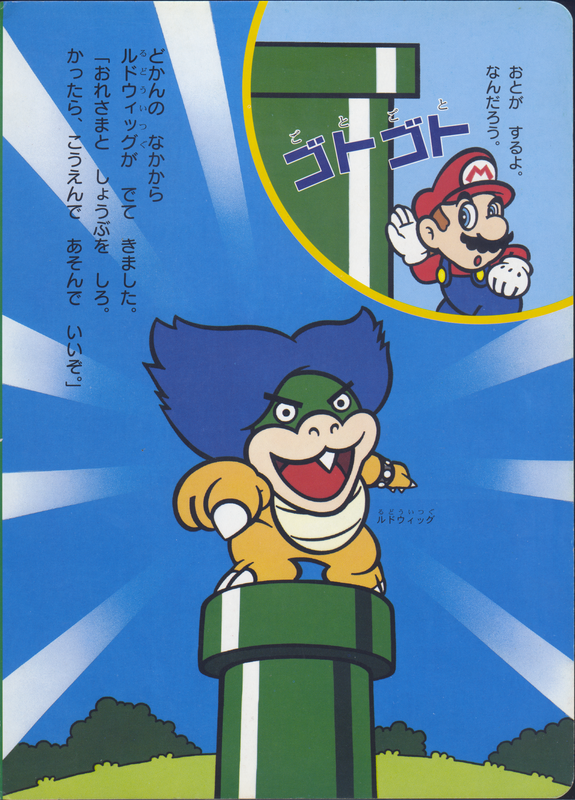 ↑ Ludwig chasing Mario in Super Mario Wisdom Games Picture Book 3: Luigi's SecretMedia:SMWGPB3 Ludwig Proud.png. 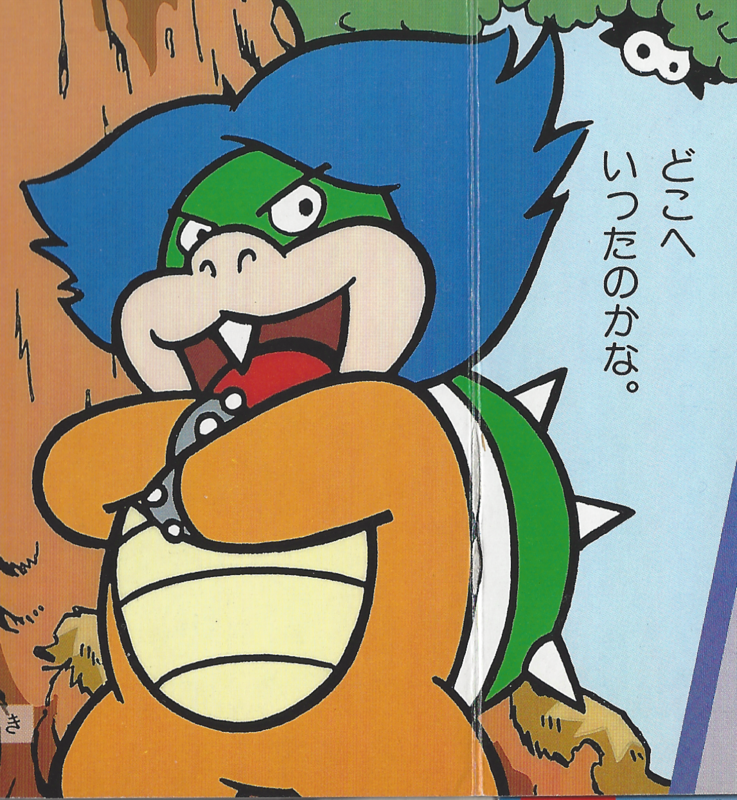 ↑ 21.0 21.1 Ludwig von Koopa challenging Mario and Yoshi in Super Mario Adventure Game Picture Book 2: Mario and Baby YoshiMedia:SMAGPB2 Ludwig OreSama.png. ↑ 23.0 23.1 Zephiel810 (February 25, 2016). Mario and Sonic at the Rio 2016 Olympic Games (3DS) - All Character 2nd/3rd Place Animations. YouTube. Retrieved February 26, 2016. ↑ stratussina (October 31, 2016). Mario paper color splash ITA #23 Base Cobalto Boss Ludwig Megavernistella Blu. YouTube. Retrieved November 24, 2016. Ludwig says, "Che lo scontro abbia inizio! Mettetevi comodi per ammirare il concerto con assolo di cannone che ho composto io stesso! ", which means, "May the fight begin! Take a comfortable seat to admire the concert with cannon solo that I myself composed!" ↑ The map of the city where the Super Bell Subway course is found. Ludwig Painting is among the "A" list of points of interest. ↑ The graffiti found in Super Bell Subway. ↑ stratussina (October 31, 2016). Mario paper color splash ITA #23 Base Cobalto Boss Ludwig Megavernistella Blu. YouTube. Retrieved November 24, 2016. Ludwig says Auf Wiedersehen! which means goodbye!. ↑ Ludwig von Koopa showing his first challenge in Super Mario Adventure Game Picture Book 2: Mario and Baby YoshiMedia:SMAGPB2 Ludwig OreSama Challenge.png. ↑ "Baron Ludwig Von Koopa-The Second Meanest Koopa Around! "Nintendo Power Strategy Guide for Super Mario Bros. 3, page 72. This page was last edited on April 17, 2019, at 08:33.